Our kitchens stand out because we treat them like furniture. By sequence matching panels and pulling lumber for color, we ensure the grain runs through when possible. By doing mostly inset work, our finished product has a nice clean look with even door gaps. The Love Residence is a quarter-sawn cherry modern kitchen accented by stainless steal countertops and a step up glass breakfast bar. This house is located in Sonoma, California on 7-acres of vineyards. This kitchen is built in a figured cherry with a clear finish accented with black stone tops and a stainless steal backsplash. 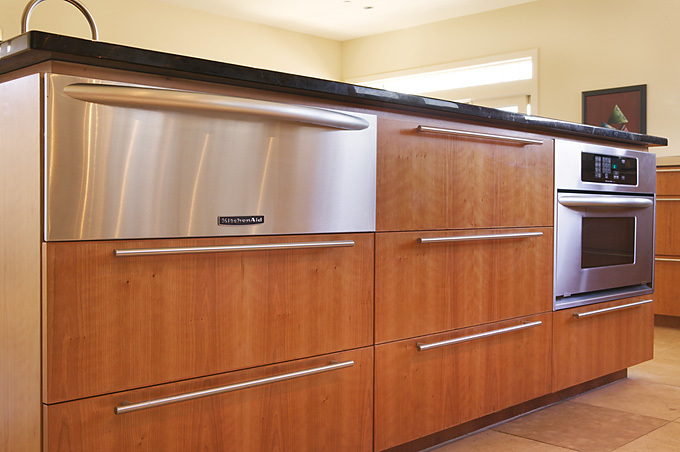 Long aluminum handles fit perfect with this modern Marin County kitchen. Built with maple sequence panels, this kitchen has a clear finish accented by dark granite countertops. This is located in Pass-a-grille, Florida. This is a traditional raised panel kitchen made of cherry with a cordova stain accented with beautiful stainless steal appliances and granite countertops with a built up edge detail. This is located in St. Petersburg, Florida. This shaker style kitchen is built in cherry with a clear finish. Bead board was applied on the peninsula to seamlessly tie the kitchen into this beautiful 1907 bungalow located in Ross, California. This arts and crafts style kitchen is built in cherry with a clear finish. The kitchen countertops are a dark stone while the peninsula countertop was created with a walnut to create a warm feel. This home is located in beautiful St. Petersburg, Florida. This shaker style kitchen was built in cherry with a clear finish with walnut countertops. The wavy glass used in the cabinets was used from recycled window panes. This home is located in St. Petersburg, Florida. This shaker inspired kitchen has a modern flair due to the increased size of the doors. 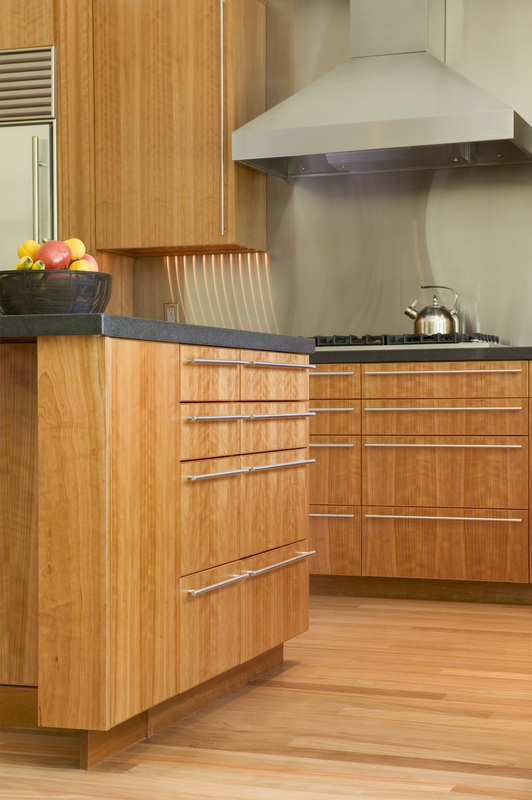 This kitchen was built with cherry wood accented with dark granite countertops. It was important for this homeowner to utilize all the space in this kitchen, as it was the main focus of the home. This home is located in Marin County, California.